Original WW2 Canadian embroidered shoulder title of the Irish Regiment of Canada, which was part of the 5th Canadian Armoured Division. 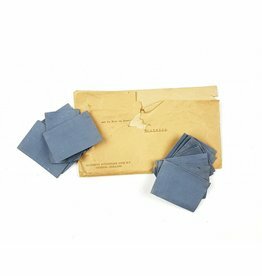 The envelope with thirteen pieces of patches were left behind in a village called Wolfheze, the Netherlands in 1945. All patches are in unissued condition. This is an original embroidered red coloured division patch worn by soldiers of the 1st Canadian Infantry Division.